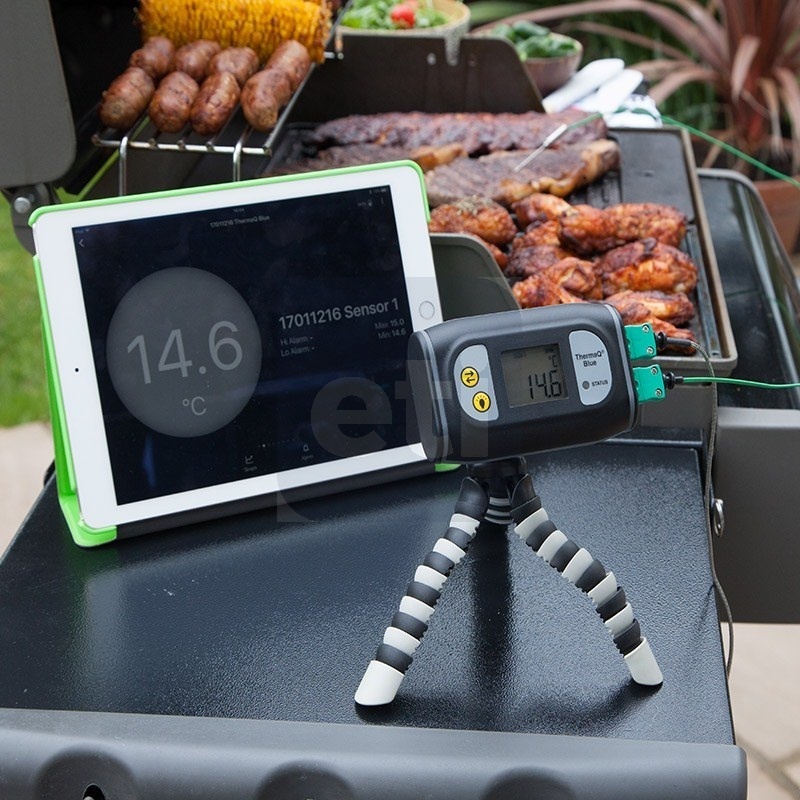 ThermaQ Blue Bluetooth thermometer transmits temperature data to your iOS, Android or Bluetooth® device. 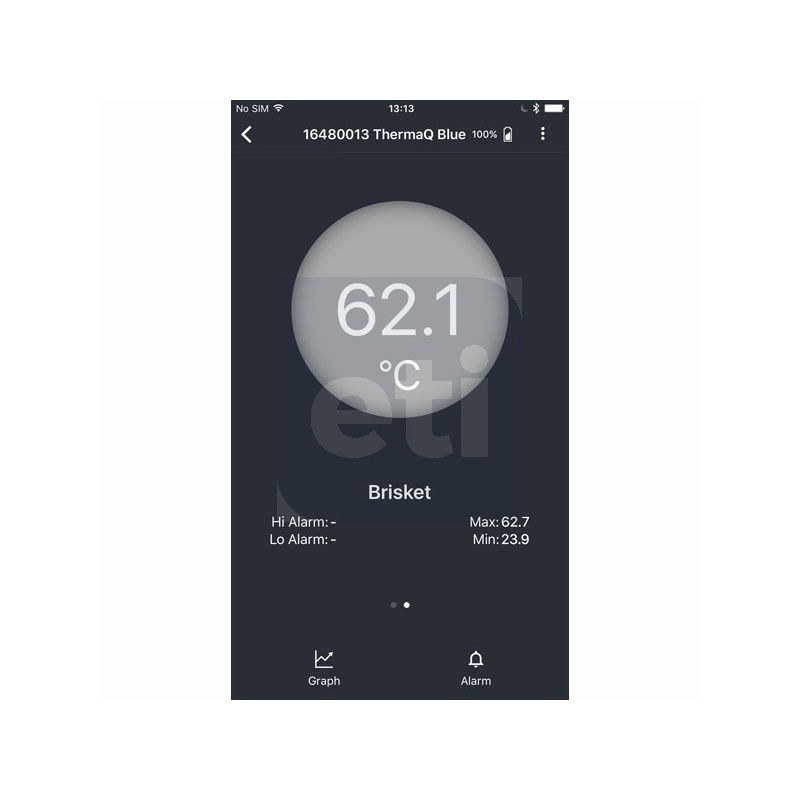 The new ThermaQ Blue Bluetooth thermometer is designed to monitor temperatures remotely. 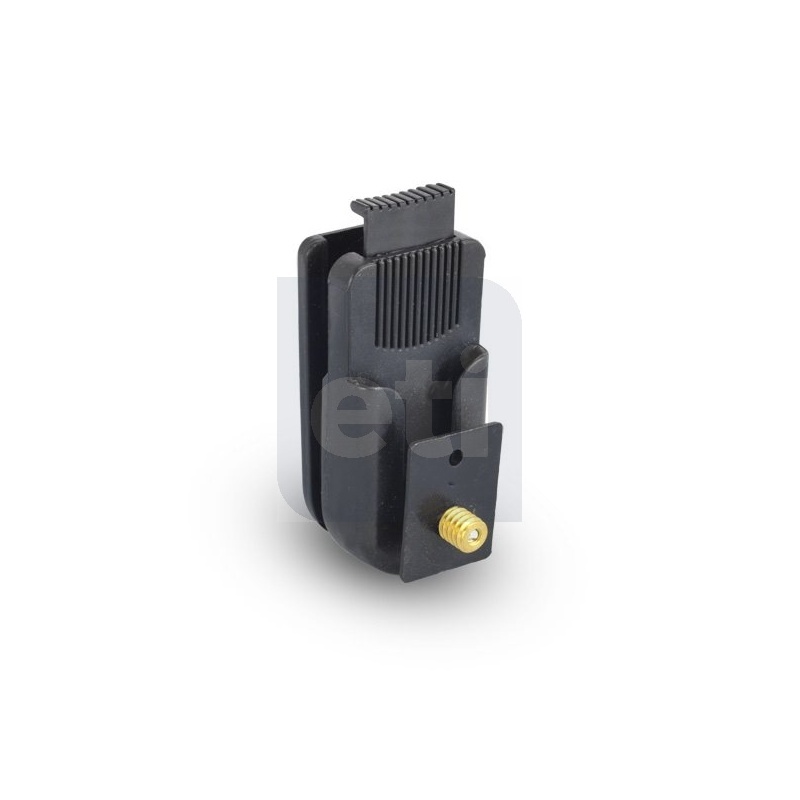 Transmitting temperature data to your iOS, Android or Bluetooth® wireless device via a secure connection of up to 50 metres. 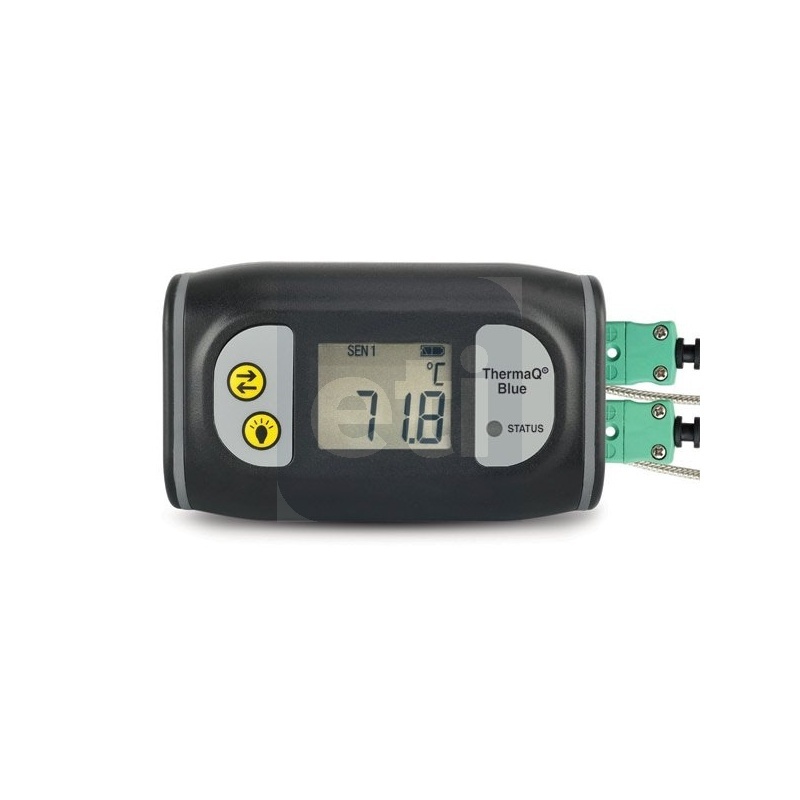 Water resistant to IP65, each unit is housed in an ergonomic case and incorporates a backlit LCD and 2 LED's which indicate alarm status. 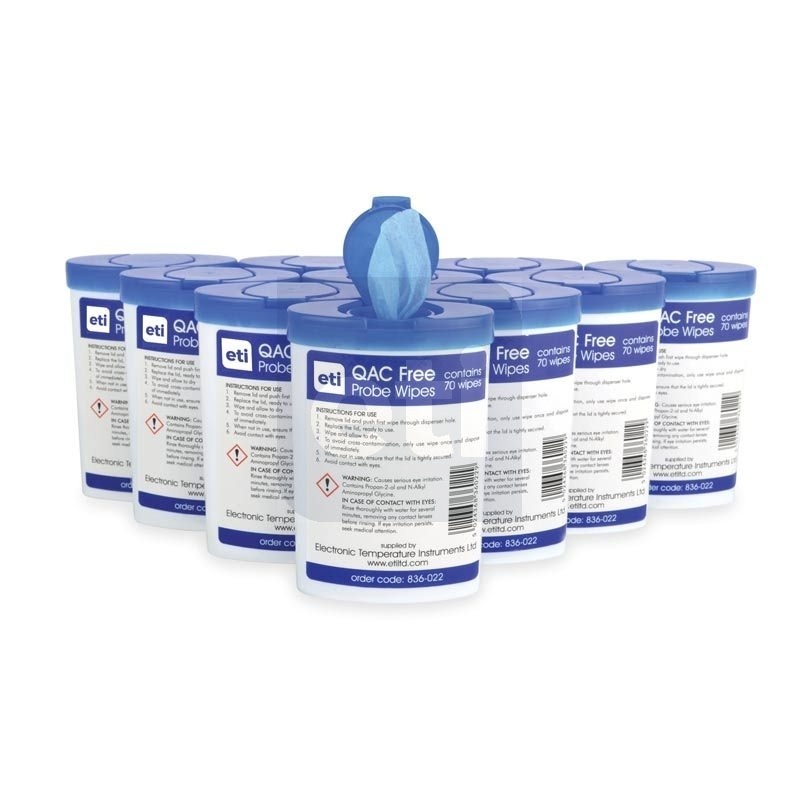 For probes to suit the ThermaQ Blue, see the accessories tab and click here. 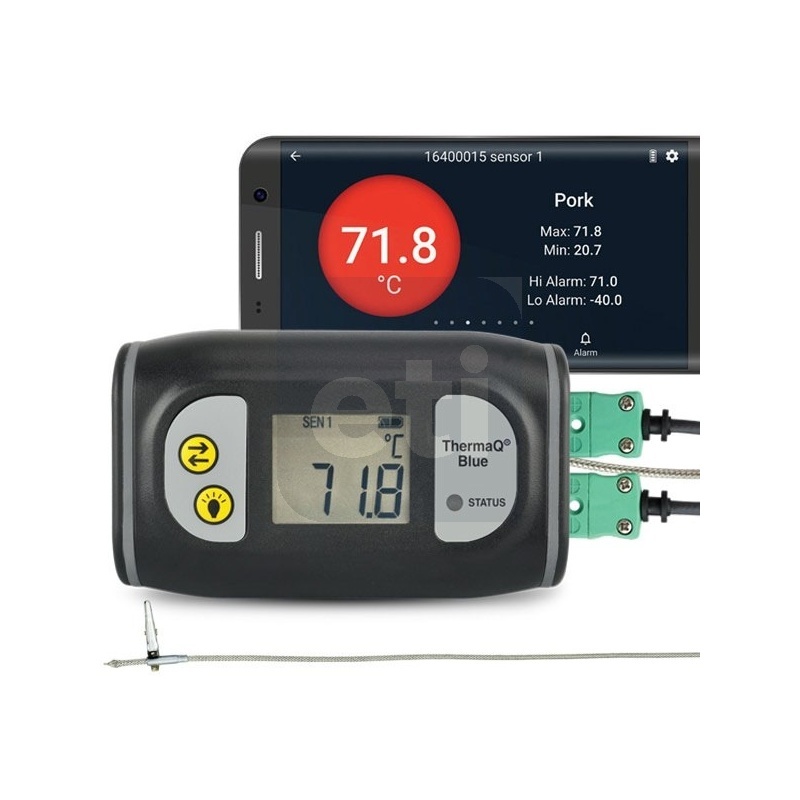 Available as a download, the 'ThermaQ App' software reads two temperatures and provides simple-to-set high and low alarms. The 'ThermaQ App' can export saved data for further analysis as an Excel (.csv) file. 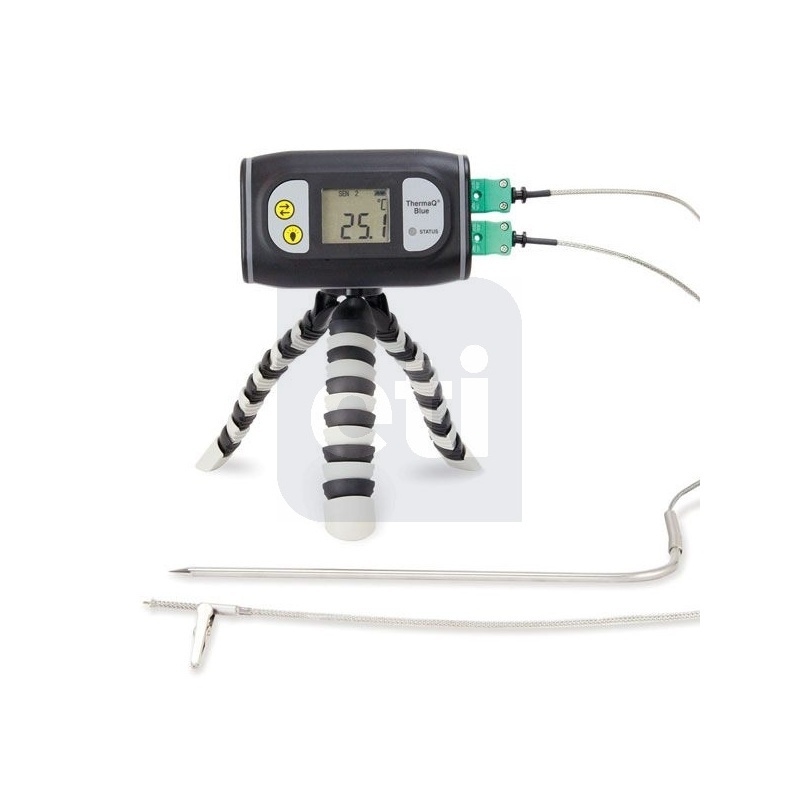 The ThermaQ Blue is available as a kit including probes and tripod, or as the ThermaQ Blue thermometer only (exclusive of probes). 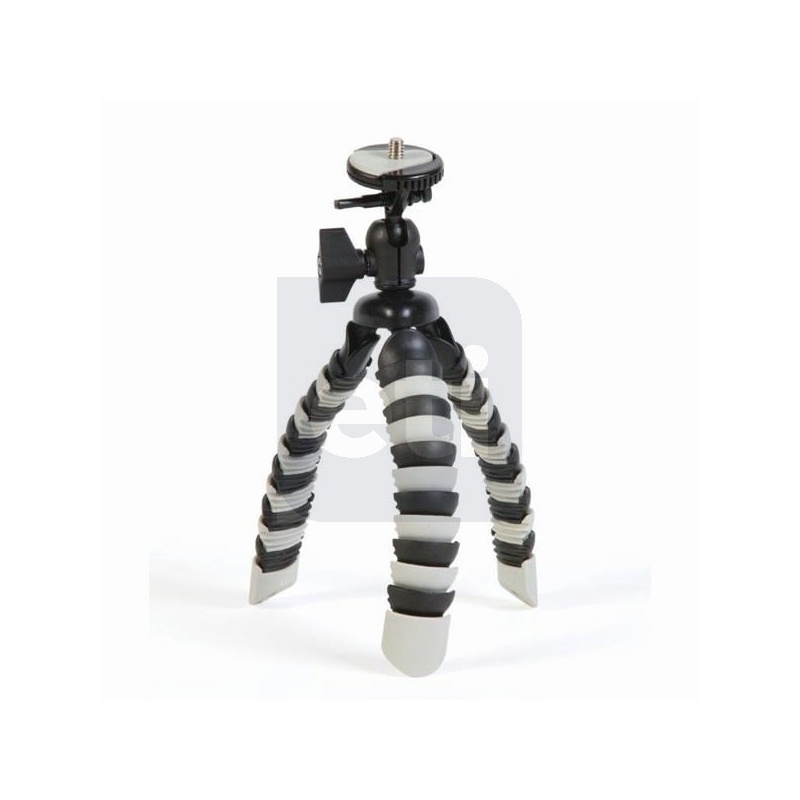 Please ensure you select the option you require from the dropdown above. 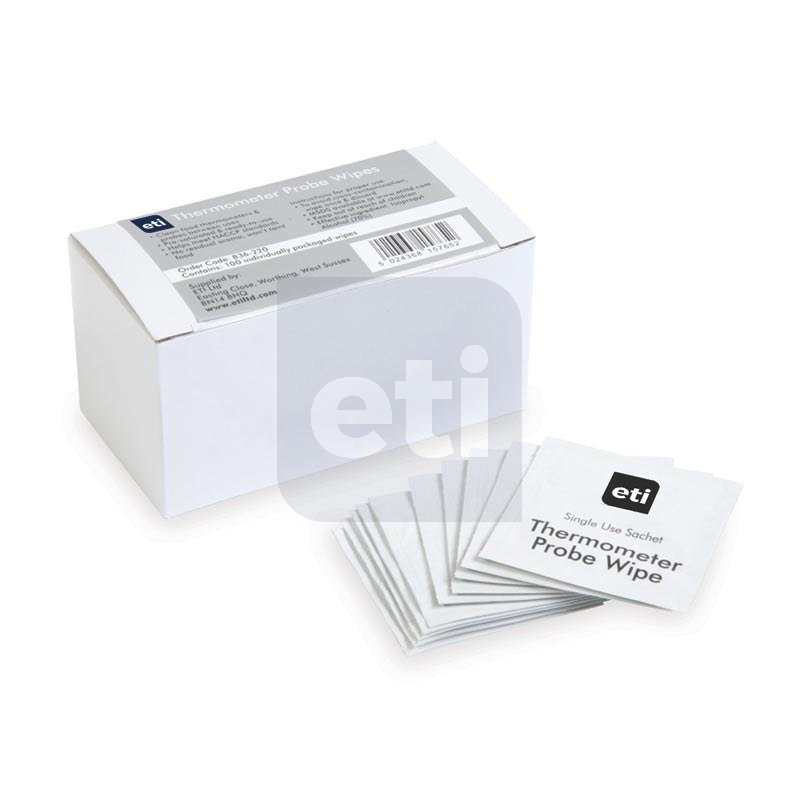 Kit option represents a significant saving on total price of items in kit when bought separately! Developed in-house by Electronic Temperature Instruments Ltd. the ThermaQ App has been designed from the ground up to provide seamless integration between your ETI Bluetooth thermometer/WiFi thermometer and smartphone or tablet. 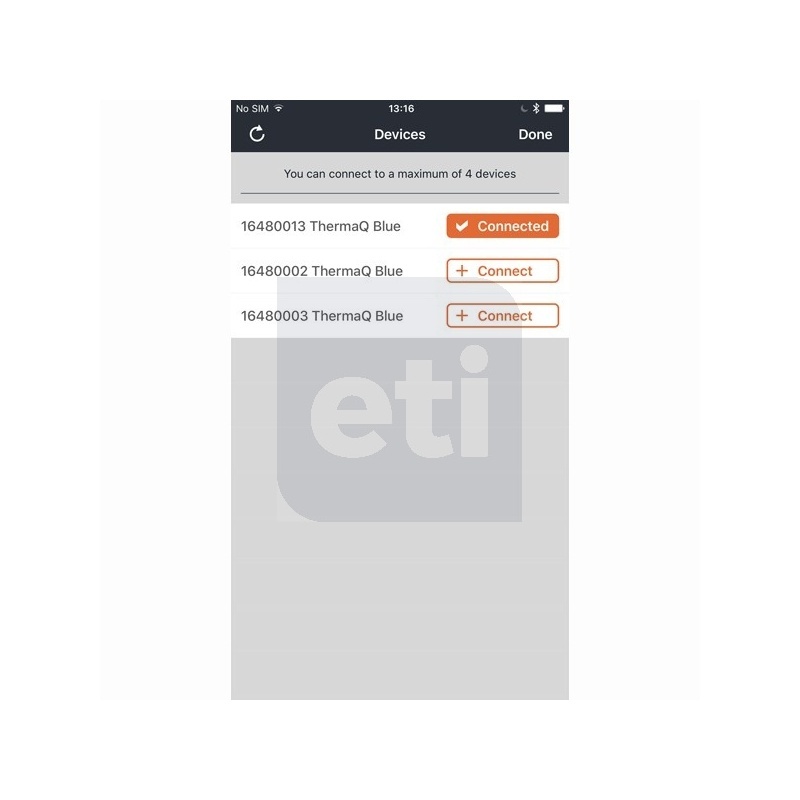 The ThermaQ App from ETI allows you to monitor multiple temperatures remotely when used with either the ETI Ltd BlueTherm® One, ThermaQ® Blue Low Energy (LE) thermocouple thermometers or ThermaQ WiFi thermocouple thermometer. 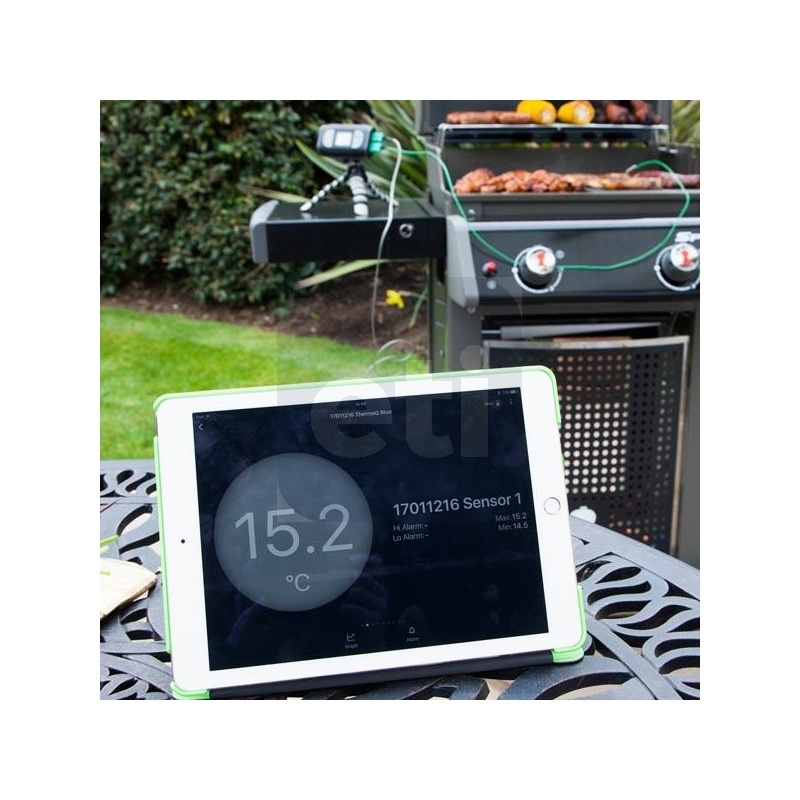 The ETI ThermaQ wireless temperature monitoring app is an invaluable tool in allowing you to monitor multiple temperatures simultaneously in industrial, scientific, food, cooking, sous vide and barbecue (BBQ) processes, turning your smartphone or tablet into a remote temperature measurement data hub. 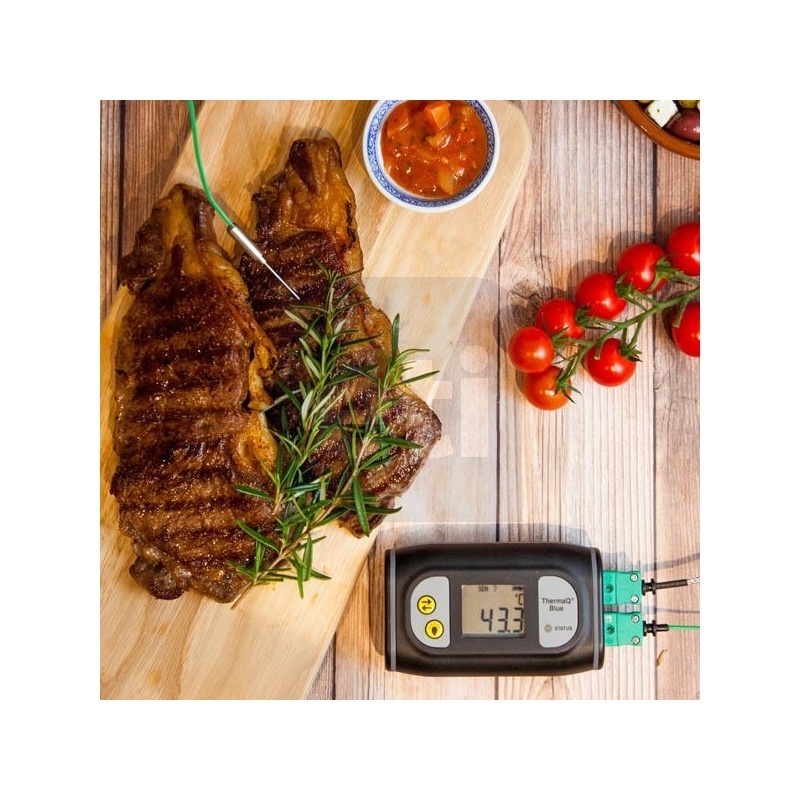 The ThermaQ app makes the cooking processes easy to replicate time after time with its user friendly temperature monitoring functions. 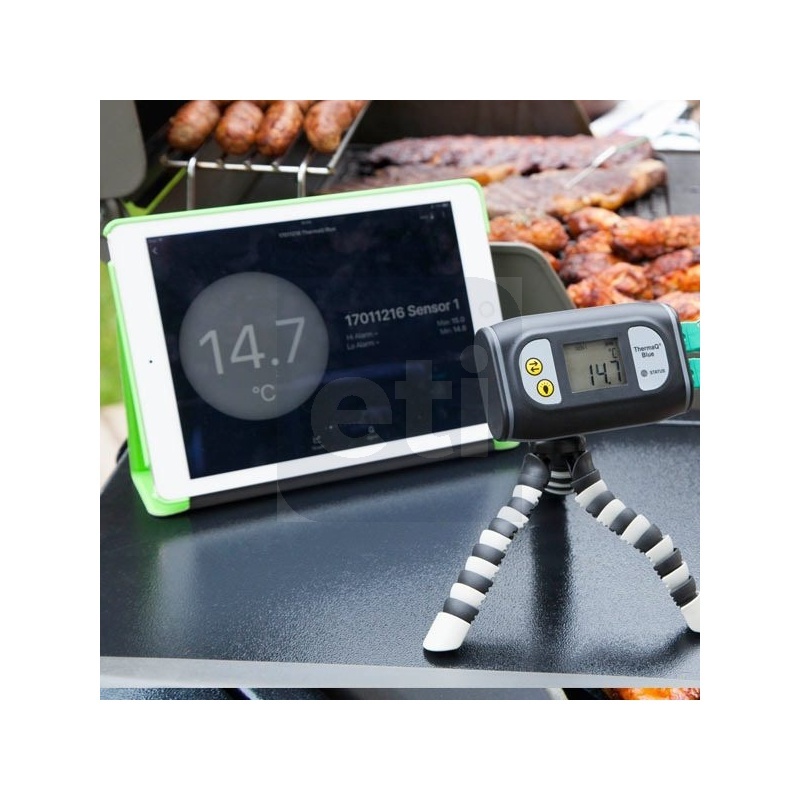 No matter if it’s a large pork shoulder on the BBQ / Smoker or a Sunday Roast in a conventional kitchen oven, you’re able to easily and quickly set a target temperature and ensure it's perfectly cooked – every time. 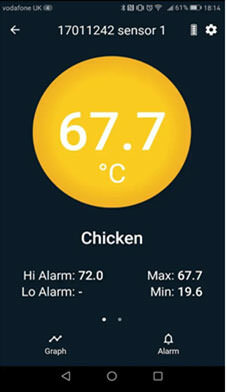 The ThermaQ App can read multiple temperatures and provides simple-to-set high and low alarms. 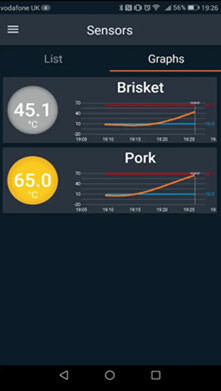 The App includes programmable alerts and notifications to prompt changes and also log data from any probes to a graph. For further analysis the 'ThermaQ App' can export saved data as an Excel (.csv) file. 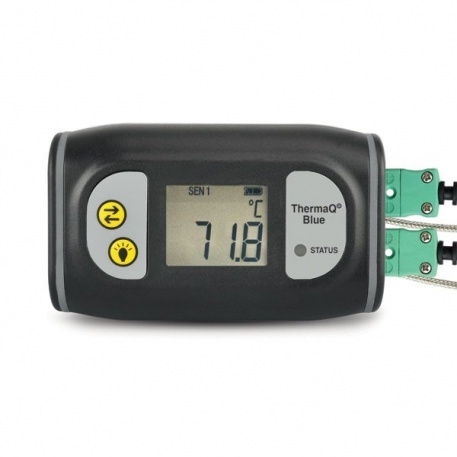 ThermaQ App' software reads multiple temperatures and provides simple-to-set high and low alarms. 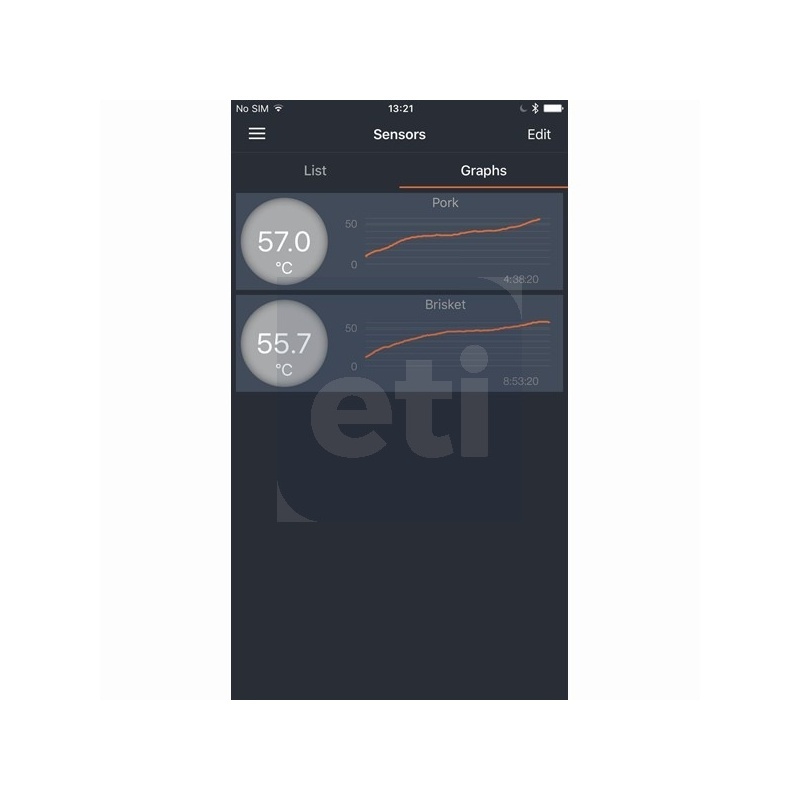 The App includes programmable alerts and notifications to prompt changes and also logs data from any probes to a graph. For further analysis the 'ThermaQ App' can export saved data as an Excel (.csv) file. 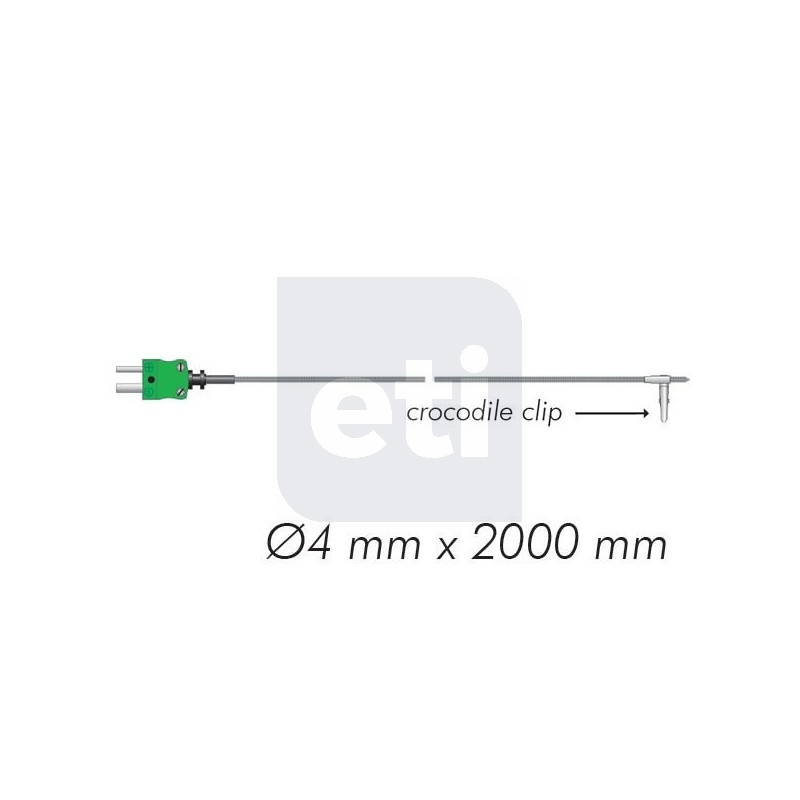 saves graphs and shares data via CSV file export (.csv) to Excel etc. 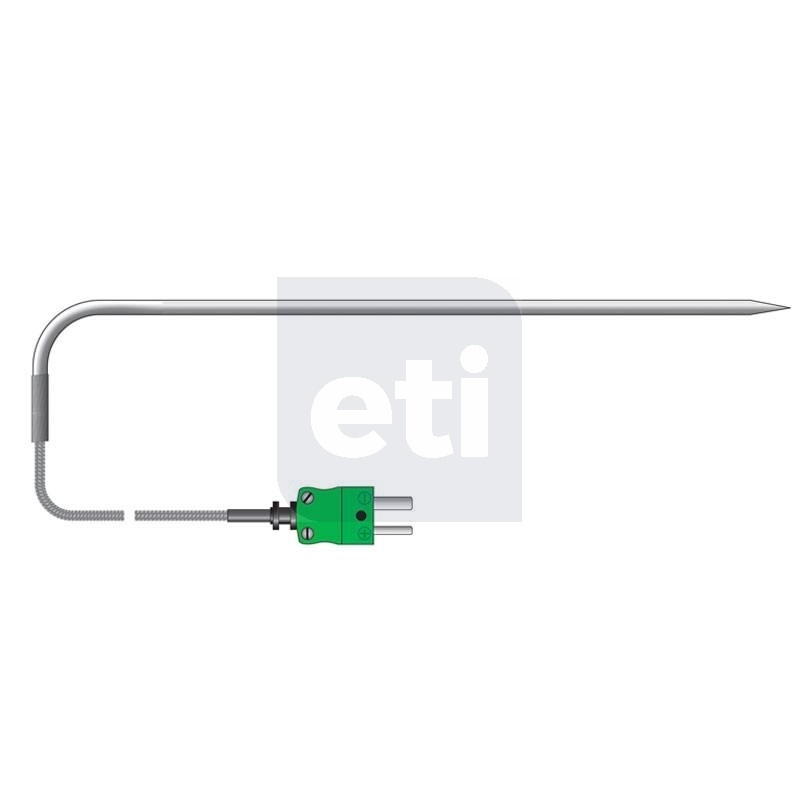 or ThermaQ® WiFi (2-channel) thermocouple thermometer.